What do you get when YouTube engineers host Telegraph Track students at their office? We put this question to today’s Hack Reactor blog post guest: Director of Growth and Inclusion, Albrey Brown. He discusses the highlights from the visit and how Telegraph Track students received great nuggets of inspiration and motivation! Telegraph Track’s goal is to diversify the tech industry by actively recruiting talented, underrepresented people, who’d like to transition their careers by becoming Software Engineers. 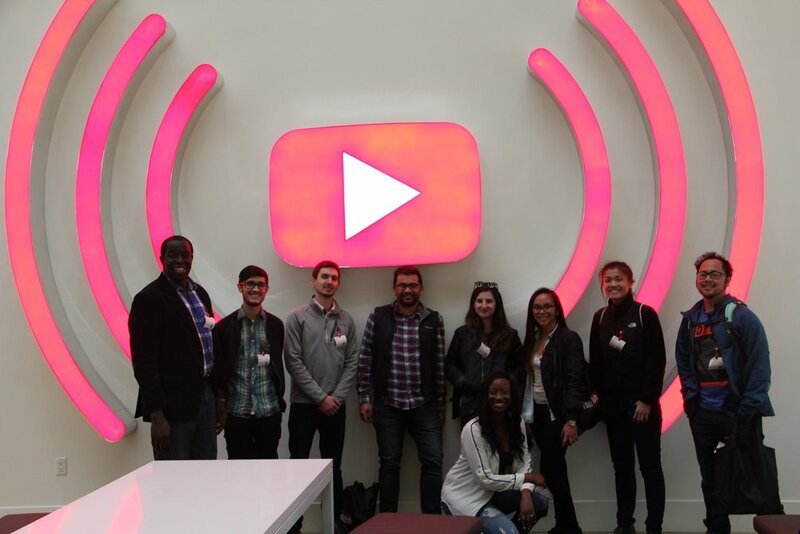 This past January, the Telegraph Track crew was invited by YouTube Diversity Staffing Partner, G'Mika Moore, to come check out the campus and get a feel for what it’s like to be an engineer at YouTube. The day started with snacks and swag as we met our hosts in the lobby of the main YouTube office. G'Mika and Terry O’Connor, YouTube Staffing Lead, met the engineers in the lobby and explained to us the agenda for the day. We were to start with lunch, tour the campus, meet with the head engineers of various projects, and — of course — try the nap pods. Over lunch G'Mika and Terry fielded a barrage of questions from our engineers about life at YouTube. Questions ranging from salary expectations, to interviewing tips, to the lunch menu (yes, they really serve salmon every day.) — we were curious to get the scoop on what made YouTube such a special place. On interviewing: Be as communicative as possible when you’re in a coding interview. The interviewer doesn’t just want to see what you’re doing, they want to hear why you’re doing it. On YouTube culture: YouTube is a part of Google but it’s a small community so it has a start-up vibe. Teams are interconnected, communicative, and social. YouTube’s views on Bootcampers: YouTube (and Google) hires talent based on merit, as long as you can do the work you’re right for the job. Being from a bootcamp does not hurt your chances as an interviewer. Post-lunch it was time to get to the main event: sitting down with YouTube engineers heading up important software projects. The Telegraph Track crew got to hear from the software engineering manager supporting YouTube Go, Adrian Isles. YouTube Go is a new app designed to broaden the accessibility of the video-sharing service and is intended to work more effectively in areas where connectivity is more limited. We then heard from Brian Karlak, a YouTube Music engineering manager. Their aim is to make discovering music on YouTube easier by providing their already robust library of songs to the user seamlessly. Lastly, we heard from David Worsham, an engineer working on bringing YouTube into the VR realm. David gave us a thorough explanation of the current VR landscape and invited us to check out the Google Jump platform as our engineers start their final projects. The excitement was palpable, updates will be coming soon. After spending about an hour hearing about the wonderful technological advancements YouTube is pioneering, we decided it was time to see the rest of the campus and head out. G'Mika took us to the main YouTube building and proved to us that working at a tech company is a whole lot of fun. Between the micro-kitchens around every corner, the video game station, the 40 foot slide, and — of course — the nap pods, our engineers were eager to figure out how they could end up at place like YouTube. Mic drop. And with that, the tour was over - our crew left with a new found wonder, and a lot of confidence in what life as an engineer can look like. G'Mika and Terry were kind enough to show us YouTube, but they also showed us what can happen when you believe you belong. Telegraph Track focuses heavily on the non-technical challenges that underrepresented engineers have to face when they work in Silicon Valley. The goal of the program is to diversify the tech industry by actively recruiting talented, underrepresented people, who’d like to transition their careers by becoming Software Engineers. Telegraph Track provides students with an extra layer of non-technical support while they attend Hack Reactor SF through mentorship, additional career training, and networking opportunities with reps from companies who are interested in building diverse workplaces. If you are interested in joining Telegraph Track or learning more, visit our page!